who make blankets for the elderly. who then sews them together and distributes the finished blankets to the elderly via nursing homes. This particular piece was made by group members from the UK, USA, Belgium, the Netherlands and Australia. All proceeds from this auction (excluding P&P costs) will be donated to Breast Cancer Care, an essential charity for anyone affected by breast cancer. Some of the contributions here were made by actual sufferers and survivors of this relentless illness. Love the blanket, good luck with it! 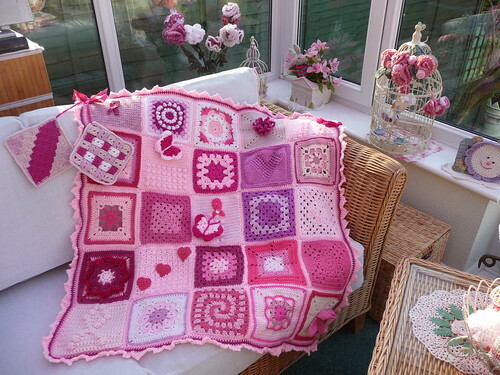 It isn't my blanket, it's one from SIBOL - I follow their blog and I know how much each bid on this blanket means. I hope you all enjoy my blog.